Forgot to tell you that when I took the chick out of the nest I found another chick that was dead. The hen had also laid 2 eggs and they are solid inside. I did put them in the society nest to see what happens as she is sitting on 2 eggs of her own. Her two chicks just fledged last friday. What a stressful time for you. I also found a dead hatchling on the cage floor and it looked to be older than a new hatchling. Then I found one in the front of the nest (which was in a large basket) which I moved to the back of the basket with the other one but he died and I guess the parents knew this and that is why they put it in the front getting ready to toss it too. I removed the male because I think he is the one who was tossing and the female took care of the last one. Could you tell if both parents were feeding or if only the female was going in the nest to feed. Sometimes its only one parent who is tossing and if you remove that one, the remaining parent will raise the chick. My male quit going into the nest after the last one died so that is why I took him out. Handfeeding is very stressful and you are very brave to do this, its a little easier when they are 10 days old because you don't have to feed during the night. I have not been put to that challange yet. Its good you had the handfeeding formula already and I can image the panic when you rushed to Walmart. Sounds like you are doing everything right as he made it through the first night. When the baby gets a little older and starts moving around put a small piece of sponge in the shot glass with the water, so he doesn't accidently drown. ranchnanny wrote: Forgot to tell you that when I took the chick out of the nest I found another chick that was dead. Your gouldian hen must have started a new clutch after the other ones hatched, hope those eggs hatch under the societies. Here is a link for information for temp. and feeding for 10 day old chicks. How is the handfeeding going with your hatchling? Things are going very good... The chick is very alert and always looks up when I open the lid to the brooder. I have added some baby applesauce to the formula as suggested by someone on Finch Forum. I am so glad that all your hard work is paying off in the health of the new chick. I know it was stressful in the beginning and you not getting much sleep that first night. It's good he was a little older, the new hatchlings are so small and so many problems can arise. Can't wait to see him grow and fledge. Keep me posted. Just checking in to see how your little "Trooper" is doing. Hi well the little guy or girl is doing really good I banded it today and all it wanted to do was flap its wings..... Its eating well and the feathers on its tail and wings are getting bigger. It knows when I lifte the lid of the brooder it looks up at me. I have some concerns about when it gets bigger and can get out of the brooder. Where should I put it in a cage by itself with a nest and continue to feed formula? Glad to hear he/she is doing good. Can you keep him where he is until he is fully feathered 18-21 days,and then move him Then you can start feeding millet, soaked seed and egg food for him to nibble on. Just gradually turn down the temperature in the warmer. Wean him on those foods as he begins to refuse formula, then put him in a cage of his own with low perches, nest and nesting material and water until he fledges. good no clicking no formula coming up but that didn't last long. I tried my best to bring him thru but things just didn't work out. I have been bummed today but on the bright side I have a pair of CB's that have eggs and my Silverbills are sitting on 4 or 5 eggs. Keeping my fingers crossed. That is so sad, I am so sorry that he didn't make it. You did everything possible for him and he was doing so good. Its so hard to lose one of your finches and especially a baby that you hand fed and spent so much time with, you really get attached to them. You did your best to help him and it just wasn't meant to be. I hope your CB's and Silverbills hatch some babies for you. Keep me posted on their progress. Lost my favorite Male Society Rainer. Found him on the cage floor the other morning there was no sign of sickness he was singing, eating etc.... I think he got spooked during the night and hit the side of the cage. I'm glad I kept his last two chicks. So sorry to hear that. I have a favorite society male I call Spike, he was one of my first male societies and he will be three years old and I would be so sad to lose him, so I understand how sad it is for you. We really get attached to these little feathered friends. I think its harder when they are not sick and die so suddenly with no signs of injury, its such a shock. I am glad you have two of his chicks to carry on his legacy. 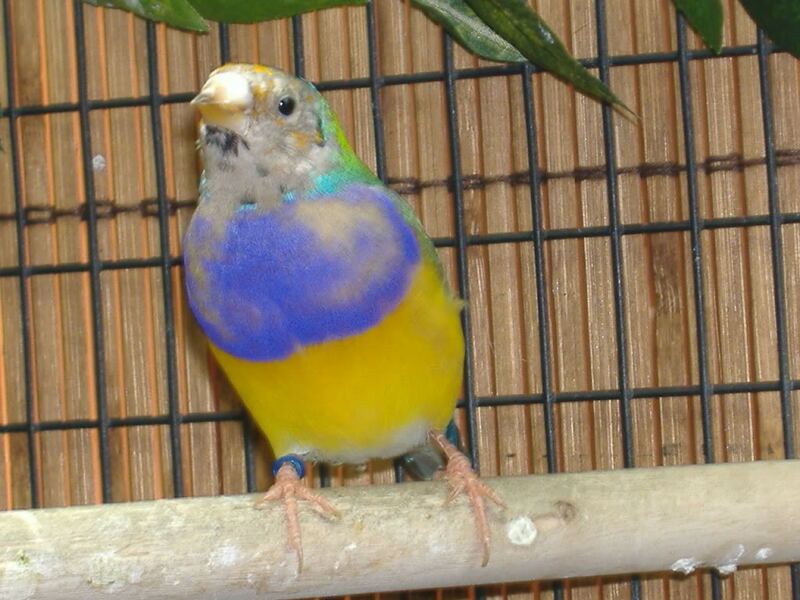 Here is a photo of the orange head gouldian that I traded one of my red headed white breast for. Very pretty, I see its molting time at your house too. All 4 of mine are molting. Is the one you traded one of the parents of the baby you were hand feeding? didn't have any white breasted males. So it was a good trade since I had only red heads. 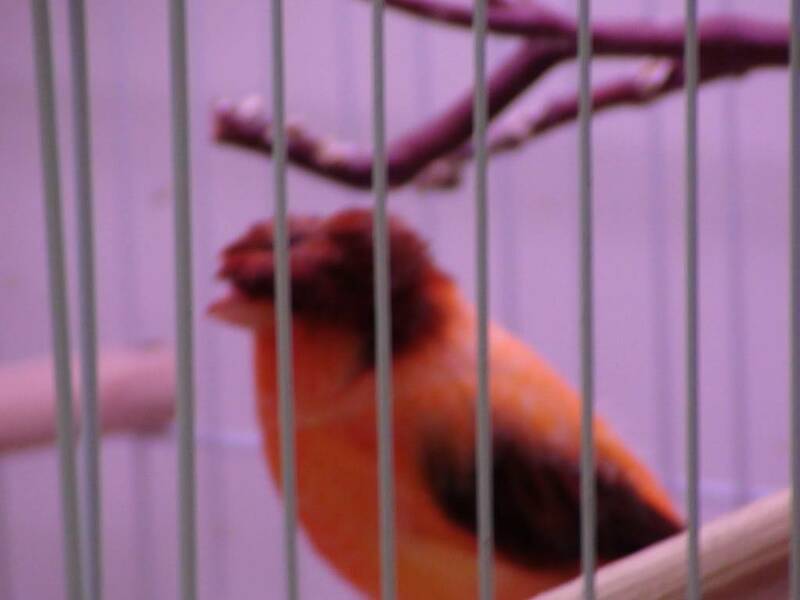 Here is a photo of one of the red headed hens I bought from her last month. I bought 2 red heads from her. 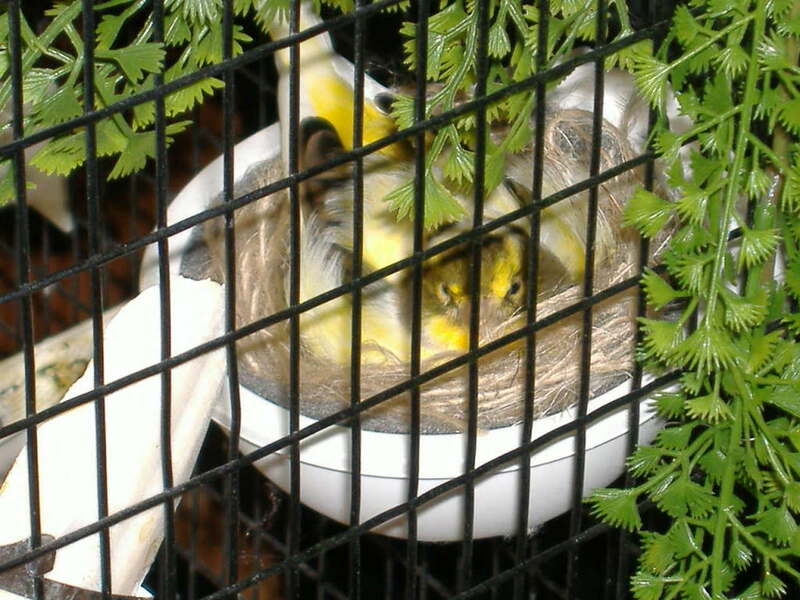 A few photos of my new canary "Pete" crested stafford and Ladybird in her nest. Pete is not her mate. Pete is so cute, I really like his crest, do you have a female for him? I like the picture of Ladybird in her nest, does she have eggs ready to hatch? Your new Red head is gorgeous, I hope you get babies from him and the Orange head. My 7 juvenile gouldians are starting to get some color on their backs but I know it will take a while before they finish coloring up. At the moment Pete doesn't have a mate Ladybird is sitting on 4 eggs. 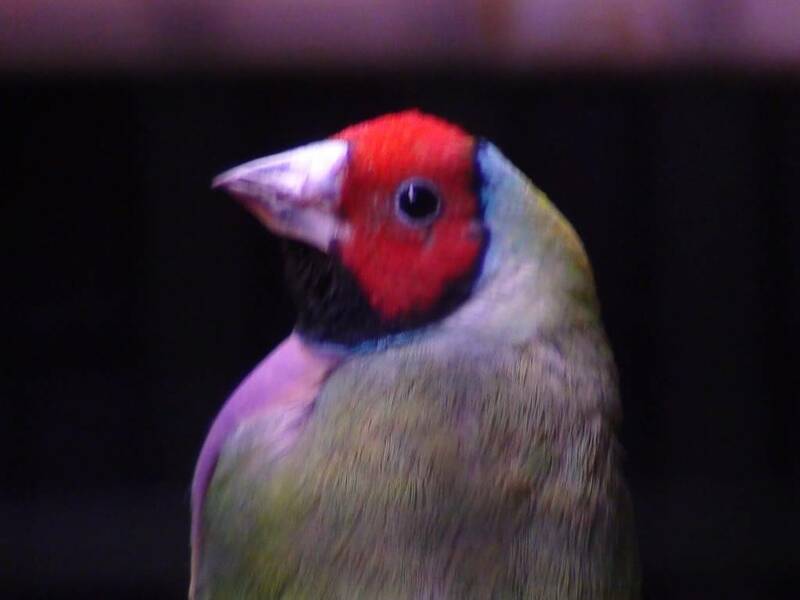 The photo of the red head Gouldian is a hen one of two that I bought last month. Sorry I meant to say her, not him. I will be waiting to hear from you when Ladybird's eggs hatch. She's a good mom and Peeps is a good dad. 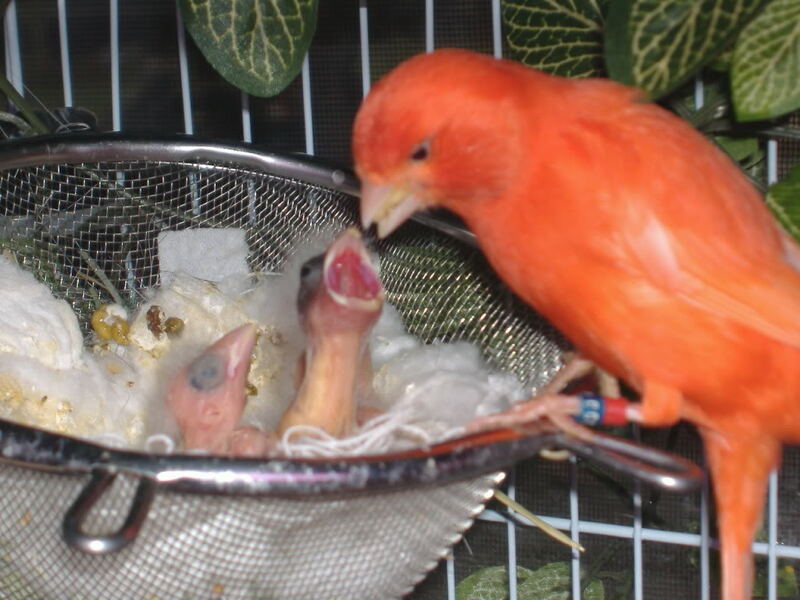 Photo of dad feeding his first clutch of nestlings. [quote="ranchnanny"]Forgot to tell you that when I took the chick out of the nest I found another chick that was dead. I forgot to ask you about the 2 eggs you put under the societies, did anything happen with them?